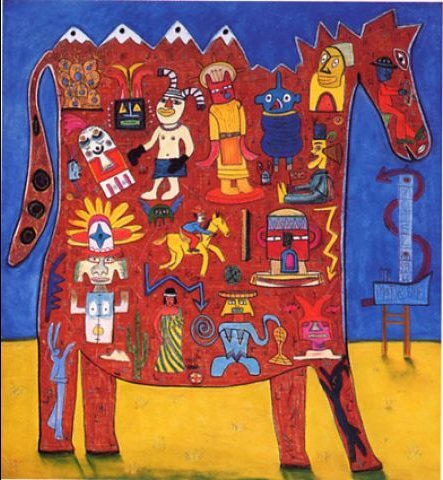 Bio: Sonoma artist Don was born in Baton Rouge, Louisiana in 1941. He grew up in Lincoln, Nebraska and in 1959 entered the Universtiy of Nebraska as an art major. At the end of his sophmore year he was awarded a Max Beckmann Scholarship to study painting and sculpture at the Brooklyn Museum Art School. Don returned to Lincoln to finish his junior and senior years and received his BFA in painting in 1964. He went to Tulane University for his MFA and graduated 1966. After three years of college teaching in Louisiana and South Carolina, Don moved to San Francisco in 1969. He has lived in the San Francisco bay area ever since. Since 1970 he has had at least twenty-eight solo shows in galleries and museums including the M.H. de Young Museum in San Francisco, The San Jose Museum of Art, The Mecene Gallery in Tokyo, Japan and the Sheldon Art Museum in Lincoln, NE. His work is in numerous public and private collections in the USA and in Japan. I have not added to my "top ten" artists who use pastel for some time, but I think Don Williams features very strongly as a contender. Superb work. Medium: Pastel; oil; gouache. Don informs me that his large pastels are on 4-ply rag board that framers use for matting. He has worked on Crescent, Rising and Nielsen Bainbridge. Lately he has been using Strathmore. Don likes that the 4-ply boards lie flat in the frame and can stand up to lots of rubbing. Subjects: Still life; landscapes (think Edward Hopper and Adolf Dehn.). Style: Photo-realist. Williams handles pastel with no nonsense, using its power of suggestion in a masterly way to create a powerful atmospheric tour de force. Navigation: Links remain available at all times, except when viewing the enlarged images, but it’s easy to get back to a gallery or the main links. Bio: Leslie Lillien Levy received a BFA from the Maryland Institute College of Art in Baltimore and studied with Harvey Dinnerstein at the Art Students League of New York, where she also served on the Board of Control. She has also studied with Daniel Greene, Albert Handel, Elizabeth Mowry, Frank Federico, Susan Ogilvie, Richard McKinley, and Liz Haywood-Sullivan. 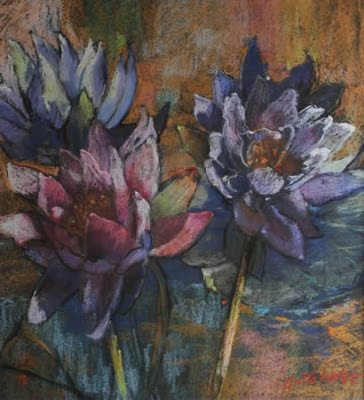 Her work has won awards in numerous national and regional juried shows including: Academic Artists Association (Best in Show 1999), Allied Artists of America, Audubon Artists, Catharine Lorillard Wolfe Art Club, Connecticut Pastel Society, Mattatuck Museum, New Britain Museum of American Art, Oil Painters of America, Pastel Society of America, Rye Arts Center and Salmagundi Non-Members Open. She had her first of many solo shows in 1999. Levy has been published numerous times. 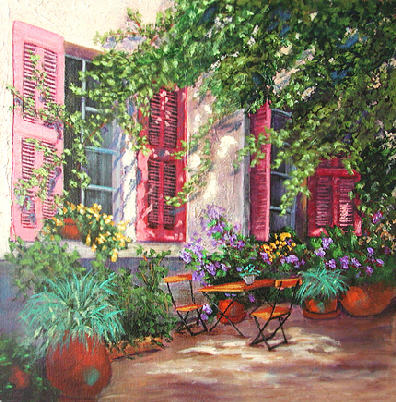 She was featured in an article in the May 2009 issue of the Pastel Journal, where three representational artists painted the same still life set-up. in the October 2010 issue of American Art Collector Magazine. 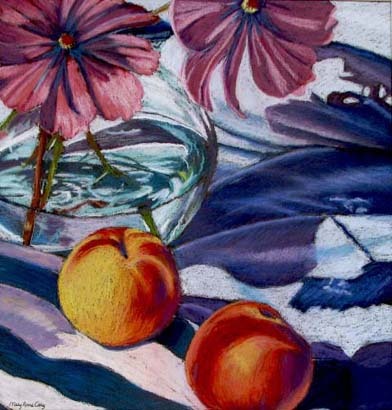 Another article about her pastel paintings and featuring a step-by-step pastel still life appeared in the July 2006 issue of The Artist’s Magazine. For three consecutive years - 2003, 2004 and 2005 - she featured in the Pastel 100. Her paintings and commissioned portraits can be found in many private collections, as well as in the Slater Memorial Museum in Norwich, Connecticut. Leslie Lillien Levy lives in Kent, CT, where she teaches still life painting in oils and pastel in her studio and at local art centres. Style: Representational. In her choice and treatment of subject matter, Levy's art is quintessentially feminine. Gallery: Still Life; Portraits and Figurative. 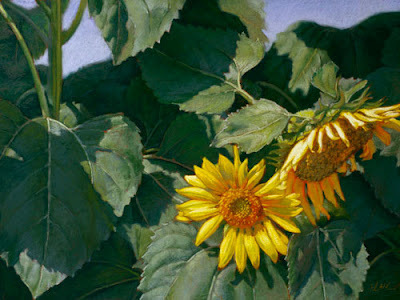 Bio: Anita Wolff was born in California, and has been receiving awards for her paintings since 1962. Inspired by the early French impressionists and the glowing emotional expression of Van Gogh, she grew to maturity in Southern California, an area saturated with the bold color and plein aire philosophy of the early California Impressionists. Anita's paintings are in many collections in the United States and throughout the world. Her first experience in plein air painting happened in Palo Verdes, with a group of watercolorists. She eschewed that medium for oils and pastel. With some friends, she decided to paint throughout Southern California. This later became serious painting from Palm Springs and Capistrano to New Mexico, Oregon, Texas, Mexico, New England, France, Scotland, Italy, Moorea and Tahiti. Anita has studied with a serious galaxy of artists, including Sergei Bongart, Robert Brackman, Frederic Taubes, Rex Brandt, Herman Margulies, Ben Konis, Bentley Schaad, Ken Paine, Dorothy Colles, Thomas J. Coates, Roy Freer, Leigh Perry and Aubrey Phillips. Her awards and memberships are too numerous to list here. Suffice it to say that she was elected as a Fellow of the Royal Society of the Arts in 2001. A book of her paintings, Adventure in Color: The Impressionism of Anita Wolff authored by Suzanne Blaney, is available here. Navigation: Intuitive, but see Image View. Gallery: Landscapes/Seascapes; Still Life; Animals (oils only); Portraits. In 1995, James decided to devote more time and energy to painting. 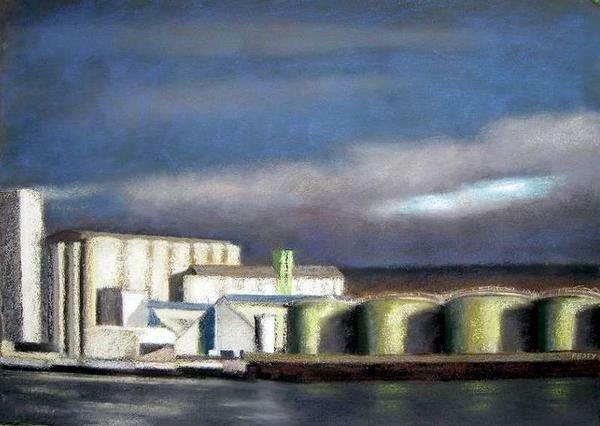 In 1994, he picked up his first pastel, James says; 'I felt at ease, it was like coming home.' He has sold hundreds of pastels, and over 1300 bronzes. James has judged and participated in the Contemporary Spanish Market, in Santa Fe, winning the Southwest Art Magazine award in 2003, First Place Awards, in Pastel 2008, 2009, and in Acrylic and Oil, 2010. The Pastel 100 has also recognized his pastels, in January 2010. 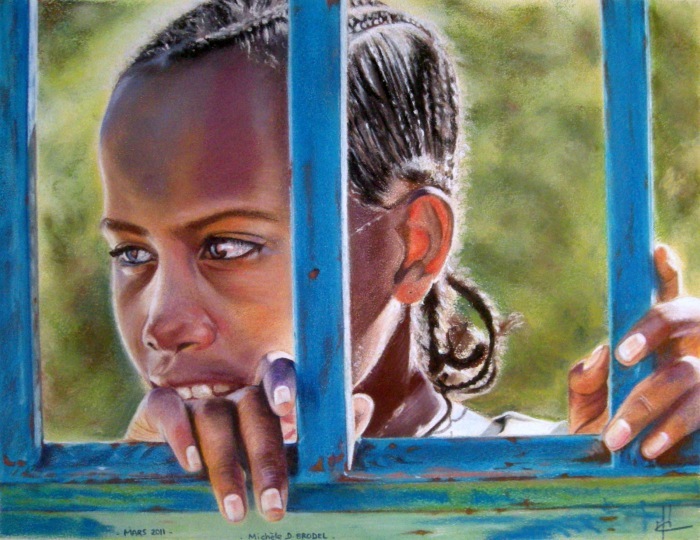 In 2010 Roybal was accepted to show 2 pastels at the Pastel Society of America show. He is a member of the Sculpture Society of America, and the Pastel Society of New Mexico. Gallery: Art Portfolio: Pastels; Impressionistic Pastels; Bronzes; Native American – Bronzes; Nudes in bronze; Oils; Giclées. Bio: New Mexico artist Paul Murray is primarily a studio artist. Most of his work is carefully crafted and time-intensive. However he also states that the experience and knowledge gained by painting en plein air is priceless. While Paul is not primarily a teaching artist, he feels it’s a responsibility of all professionals to pass on what they have learned by teaching their particular styles and techniques. He has taught three or four classes a year for the last decade. His classes usually include sessions in monochrome (for value), exaggerated colour (for emotion) and constant attention to compositional and emotional solutions. Paul’s inspiration is drawn from unusual sources. He is a big fan of the Abstract Expressionists, particularly Mark Rothko and Franz Kline. 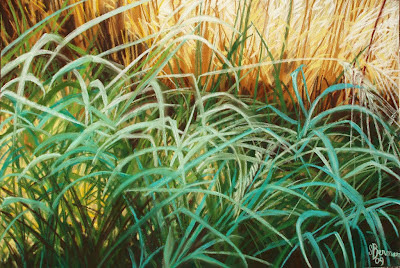 Paul is a member of the International Association of Pastel Societies (IAPS) Master Circle, and was also elected a Master Pastellist in the Pastel Society of America in 2009. He is one of only a handful of pastel artists in the world who have been honored by both societies in this way. Paul as also won Best-of-Show in both the IAPS Biennial competition (2001) and the Pastel 100 (2006). To date he has won eight Best-of-Show awards ranging from local to international competitions. Apart from private collectors, Paul’s work is also to be found in the US State Department, Sun Health Care, Corporate collection NM State Fair Fine Arts Gallery, and the Permanent Collection City of Albuquerque Public Art Collection. Navigation: Website is simple, and easy to negotiate. Image View: The thumbnails run along the top of the viewer – you don’t know until you click on one what the medium might be. Medium and dimension are given and download is possible. Siga el Rio is 15 x 23 ins, 576 x 389, 230 KB. Navigation: Website is basic, and easy to negotiate. Blog: The blog concentrates on Mary Annes’ exploration of oils rather than pastels. Bio: Sylvie Berman is a French artist who now lives in Corbières. From an African childhood she preserved a love of nature and of powerful contrasts of shadow and light, contrasts she rediscovered in the Languedoc. Sylvie studied art at the atelier Met de Peninghen (Paris), atelier du Mai (Malakoff), and the École Nationale des Arts Décoratifs (Paris) where she learned a variety of techniques including screenprinting, etching, oil and watercolour. But she says that discovering pastel in 1985 was for her a revelation. Sylvie has also worked in fashion design, poster design and oriental rug restoration. She has been exhibiting since 1975, in Hérault, the Aude, and Paris. Navigation: Website is in French. Links remain available at side of page. It is a nicely-designed site, unlike many French art websites that seem to lack focus, and to have obtrusive advertising that detracts from the site’s primary function, which should surely be to display the art. Image View: Information is generally provided on mouseover on the thumbnails, which are presented to look like 35mm slides (remember them?) Click to enlarge in a slideshow, where right click is not disabled - but work fast before the image moves on! (There is in fact a pause button) Blés herbes bleues is 65 x 50 cm., 1084 x 627, 218 KB. 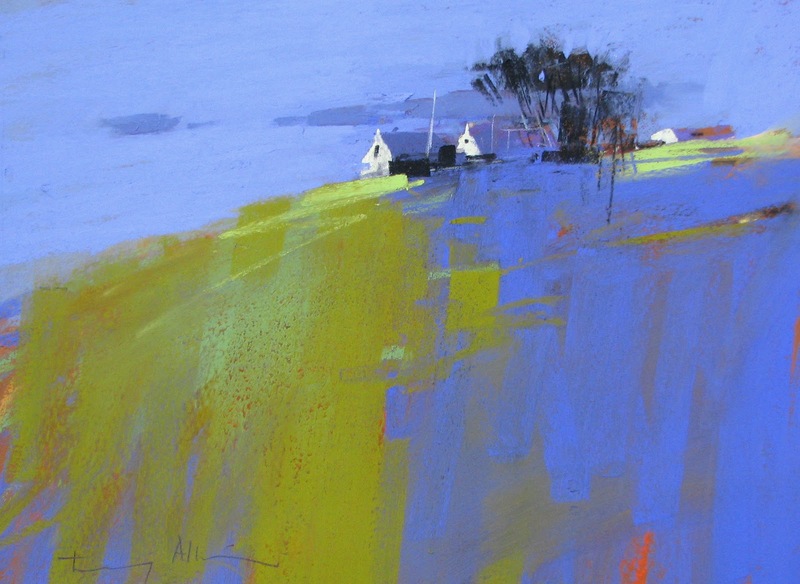 Bio: Tony Allain was born and raised in the Channel Islands and has been painting for over thirty five years, first becoming interested in painting and drawing at about the age of 15 years old, when he saw a French Impressionist exhibition in London, especially the work of Claude Monet. A self–taught artist, Tony spent the next twenty years exhibiting with local art groups and societies and finding galleries to show his work. 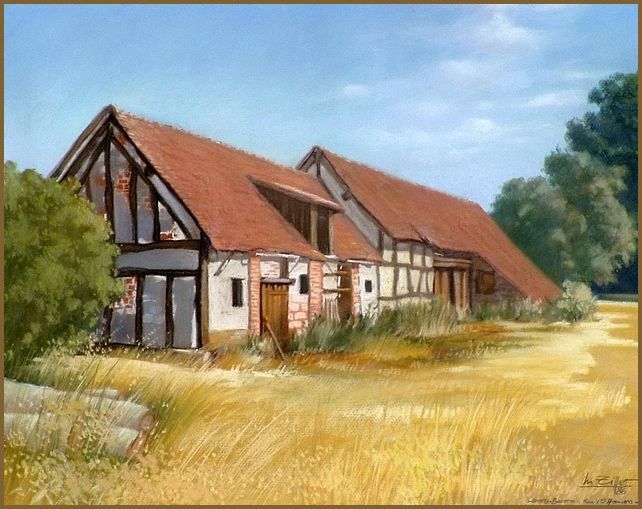 When elected a member of the Royal Watercolour Societies Art Club in 1977 he decided to become a full time painter. Tony moved to St. Ives in Cornwall to paint with the Painters of Light before moving to Nelson, New Zealand. 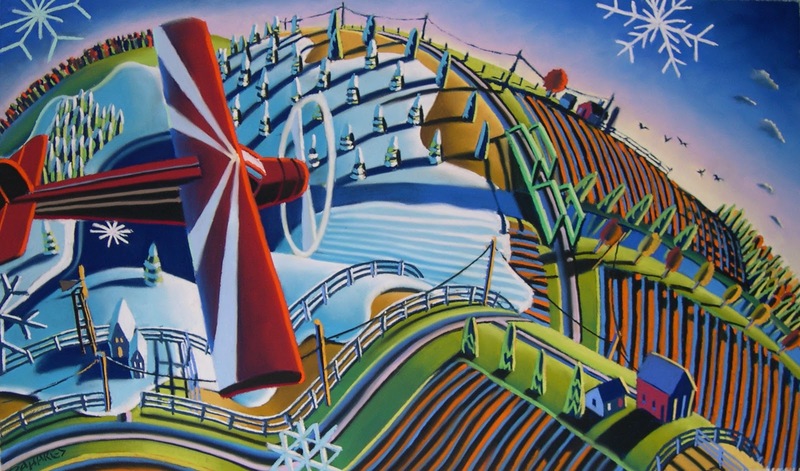 Tony has exhibited extensively over the years, his work can be found in many leading New Zealand, London and provincial galleries as well as private and corporate collections, including the Maritime Museum, Guernsey. 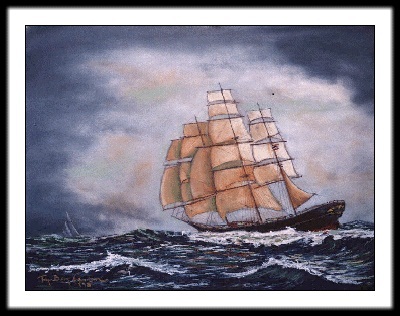 In 2004 Tony was commissioned to paint twelve paintings for the state rooms on board the Queen Mary 2. Tony is a Distinguished Member of the Pastel Artists of New Zealand and a Signature Member of The Pastel Society of America, and a member of the New Zealand Academy of Fine Arts. 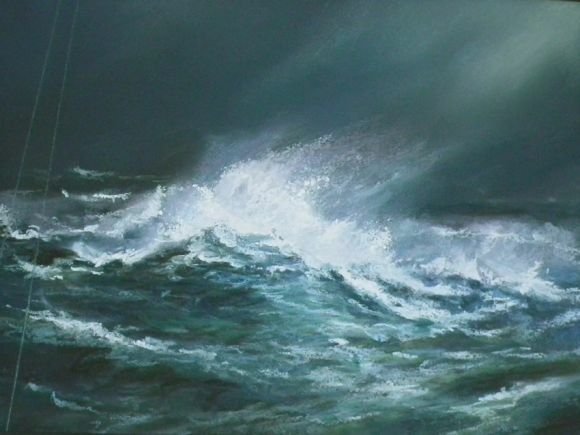 He has exhibited with the Royal Society of Marine Artists in London. Subjects: Landscapes, town and street scenes, maritime, figurative, still life. Image View: Thumbnails enlarge in viewer. Information is generally provided on medium and dimension of original. Right click is disabled so regular download is not possible. Towards Lihou Island is 10 x 12 ins. Blog: http://www.tonyallainfineart.blogspot.ie/ - this probably ends in a different country domain depending on where you are. Bio: Michèle Duretête-Brodel worked as a social worker for thirty years. In 2003, thanks to an encounter with a artist and teacher Stéphane Jadot, master of trompe l'oeil, Michèle resumed a youthful passion for painting. In 2006 she discovered pastels, particularly suited to portraits, her preferred subject. She has been a prize-winner at St. Aulaye three years in succession (2009 – 2010), and at the Concours National “Beaux-Arts” de la BNPP, Paris, 2010 and 2011. In July 2009, she did a course in live portraiture with master pastellist Gwenneth Barth. Michèle Duretête-Brodel is a member of Pastel en Périgord and of its committee. She also holds membership in ASPAS, Pastel en Bretagne, and Art du Pastel en France. Navigation: Website is in French. Use the headings as listed under “Gallery” to find the pictures. Gallery: Portraits d’ici: Enfants (Local Portraits: Children); Portraits d’ailleurs: Enfants (Portraits elsewhere: Children); Portraits d’ici: Adultes (Local Portraits: Adults); Portraits d’ailleurs: Adultes (Portraits elsewhere: Adults); Portraits crayon/fusain (Portraits in pencil and charcoal) ; Animaux (animals). Blog: Website is a blog. Bio: Born in Savannah, Georgia and raised throughout the United States and Europe, Alexandrine Bartlett currently lives in a 17th century mill, on a winding stream in a small German village near the French border. While attaining her BFA in Drawing and Painting at the University of Georgia in the early '70s, Alexandrine Bartlett concentrated on large abstracts and semi-representative figurative subjects in oil. Fascinated with the beauty of human anatomy, Alex completed an MA in Medical & Biological Illustration at the University of California, San Francisco in 1985. Alex worked for eight years as a medical illustrator for the U.S. government, progressing from illustration into supervision and management. During those years she focused in her free time on her passion for painting and her concern for endangered species by completing a series of very tightly rendered dry-brush watercolour wildlife artworks. Frustrated by the lack of time she could dedicate to her creative gift Alex left her successful career in 1993 and dedicated herself to painting full-time. At the suggestion of master painter and mentor Albert Handell, Alex tried pastels in 1997 and the result transformed her work. The brilliancy and immediacy of pastels dramatically affected both how and what Alex painted. She subsequently attended workshops with Greg Kreutz, Doug Dawson, Richard McKinley, and Duane Wakeham. 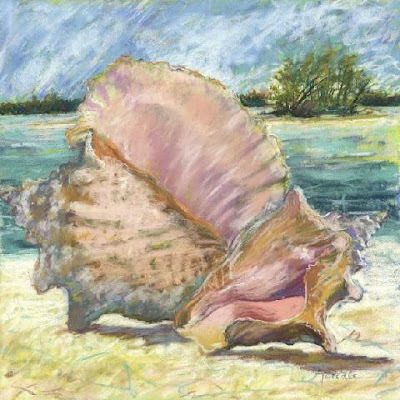 Alex's pastels have garnered recognition and have been winning awards in numerous national and international juried art shows since 1999. 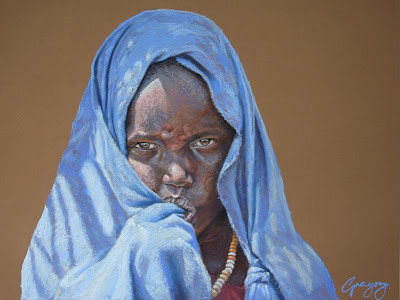 She was featured in the first Pastel 100 competition in the year 2000, and again in 2004 and 2006. Twice yearly she shows new works in Germany. Her memberships include signature membership in The Pastel Society of America and founding member of the Portrait Society of America. Navigation: No difficulty – all necessary links remain available. 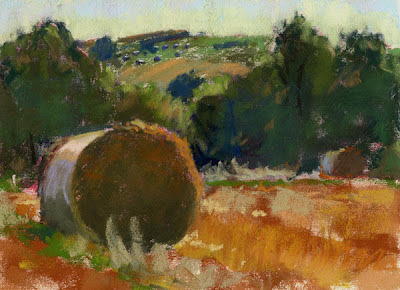 Gallery: Portfolio: Figures; Landscape; Plein air sketches; Still Life. Image View: Thumbnails enlarge in a new page. This is where information is provided on title, medium or dimension. The images will enlarge further in a pop-up window and download is possible. Summer Harvest is 5 x 7 ins, 600 x 435, 82 KB. 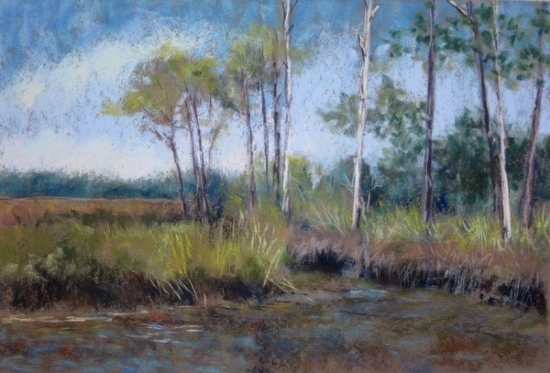 Bio: After graduating from high school, Florida artist Donna Tweedle attended Wesleyan College in Macon, Georgia, here she majored in Fine Arts. Donna’s medium and style has evolved over the years from oils to watercolour, to pastels. Her work may be seen at Alada's Gifts and The Framemakers Gallery, Leesburg, Florida. Donna has received awards at the Disney Festival of The Masters and the Winter Park Sidewalk Art Festival, as well as other local, regional and national showings. She has served as president of the Leesburg Art Association and was a founder of the Leesburg Outdoor Art Festival. Style: Representational to impressionistic. Donna likes to work plein air. Navigation: Links remain available at top of page. This is a very basic website. Gallery: Gallery; St James Retospective(sic). Each is a single page of thumbnail images. Image View: Thumbnails enlarge in a pop-up slideshow. No information is provided on title, medium or dimension. Download is possible. Bio: Terjeberg Larsen was born in 1953 and raised in Stavanger, Norway. He was taught by, among others, Äke Skjold, Jacob SjÅthun, Jacob SjÅthun, Konrad StrÅmmen, Roland Lengauer, and Reidar Berge, (life drawing / pastel / sculpture 1993-95). He has participated in numerous collective exhibitions in Rogaland and in Çrekke, and has had a number of solo shows in Folkets Hus and in Galleri Astro in Stavanger. Image View: There are only 8 thumbnails featured, and they barely enlarge. I suppose that I have included this website because this is the first Scandinavian pastellist I have come across. The work is competent, but the website minimal. The images download as gifs. Bio: Jérôme Festy lives in Vincennes, near Paris. From 1975 to 1980 he worked with architect Christian Durupt. For the next four he produced video advertising for clients such as Cartier and Peugeot, and worked in set design. He started to exhibit his art in 1984 and has had numerous exhibitions since, in France, Japan and the USA. His work hangs in public and private collections, including Faïence de Giens, Hugo Boss and Monnaie de Paris. He has published a book of pastels, Les divinités particulières which brings to mind Les Histoires Naturelles of Jules Rénard. (Renard is one of several popular philosophers whose quotations appear on the roadsigns of Project HIMANK in the Ladakh region of northern India. On one such sign in the Nubra Valley, he is quoted as saying "Laziness is nothing more than the habit of resting before you get tired"). Medium: Pastel; charcoal. Jérôme Festy uses Velin d'Arches, 640 gr. as a support. Les pastels de Jérôme Festy se tournent fréquemment vers des paysages maritimes. « Je suis un infatigable voyageur. Et c’est vrai que mes voyages m’ont souvent conduit sur les plages et les océans. Ma plus belle aventure reste celle des iles Kerguelen embarqué à bord du célèbre paquebot Marion Dufresne. » Il en a ramené de belles sources d’inspiration. L’artiste travaille actuellement le pastel et le fusain noir et blanc sur de grands formats. C’est son nouveau domaine de prédilection. Le résultat est très contemporain, la technique d’une grande maîtrise. Jérôme Festy est un sculpteur animalier reconnu. Ses animaux coulés dans le bronze, en résine ou en aluminium, comme échappés d’un cirque, jouent aux équilibristes, et forment un défilé improbable. Ils sont libres en somme. Un éléphant grimpant sur un chapeau, une tortue marchant sur des œufs, et cela sans peur, sans crainte, avec une tranquillité déconcertante pour l’homme que nous sommes…nous qui ployons parfois sous le poids de nos vie, nous qui cherchons constamment notre équilibre, voilà ces animaux qui nous invitent avec humour et espièglerie à nous libérer de nos poids. Style: Representational. Some of his exteriors with buildings call to mind the loneliness of Hopper’s interiors. Navigation: Website is in French. Links remain available on top of page. Festy has the grace to credit the designers both of the site (coding) and the graphics (design). Gallery: Les oeuvres: Fontes (bronze); Pierres (stone); Pastels de terre (landscapes); Pastels de mer (seascapes); Dessins (drawings); Portraits. Image View: Images are displayed in one size only in a viewer where they may be seen in sequence. Information on title and medium (but not always dimension) is provided. (You can see bigger images on Artistesdelavenir) Les Cuves is 89 x 119 cm. Bio: Artist Heather Harman turned professional as a teenager and had a very high profile career as a portrait painter. She took a BA hons at Lancaster university where she was probably the first to study the history of the pastel medium to academic level - completing her dissertation in 1994, alongside her studies into the history of women artists. Although Heather Harman now lives in Andalucia, the rich colour of autumn in Britain remains one of her favourite subjects. Her focus is on the quality of light, the richness of sunshine, and colour-infused shadows - all to be found in the alleyways, patios and courtyards of white-washed Andalucian villages. Heather had her first solo exhibition in 1975, showing 36 portraits of people within the music and entertainment industries. She has been a tour artist with Scottish comedian Billy Connolly and has since worked for many more show-business celebrities (e.g. Elton John, Barbara Streisand). As well as holding further solo exhibitions, and having her work in private collections worldwide, Heather is in demand as juror, and writer. She has had a long association with Unison Pastels, and has put together a Mediterranean selection for them. She continues to take commissions for portraiture and exhibit her landscapes in various galleries, and lectures on her favourite subjects: portraiture and pastel. Heather was founding President of ASPAS (the Spanish Pastel Society), and of the Andalucian Society of Portrait Painters; she is a member of the Société des Pastellistes de France, and the American Portrait Society, and on the board of the infant Pastel Guild of Europe. Navigation: Links remain available at top of page. The whole website, including the text, is presented in Adobe Flashplayer. Gallery: Skyscape Series; For the Love of Drawing; Landscape Mediterranean; British and French Landscapes; Portrait; The Winter Harmony Collection; Garden Themes. Image View: Thumbnails enlarge in a viewer on same page and cannot be downloaded. The copyright notice is displayed on the image and can at times be quite obtrusive. River Bed - Velez Malaga is originally 19 x 24 ins, 500 x 375. 54 KB. Bio: Cynthia Blair is classically trained as an illustrator, but although certainly a bona fide traditional artist, she is equally at home in the digital world. 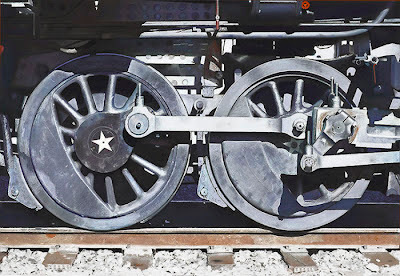 Blair makes use of Photoshop to develop and refine painting concepts which are then are used as references for the final painting. Blair is an award-winnig artist and has been featured in several art magazines, as well as being a signature member of a number of art societies. Blair uses her expertise to assist other artists bridge the gap between the traditional and the digital art; she has worked with clients locally and worldwide, pointing them to new markets through custom designed websites and social networking. She also mentors young artists online through DeviantArt.com. "I never wanted a "real" job. Life as an artist is like being a kid in a candy store. Wouldn't it be fun to draw portraits of rock stars and guitar heroes? Maybe some of my heroes from Lord of the Rings? Paint seascapes in oils? Grab some pastels and paint animals, landscapes, and people? Play in Photoshop? Design political banners and medical concepts in Flash? Create theatre posters in Illustrator? Design unique websites for personal portfolios as well as business websites? How about mixing traditional and digital together? Some used to tell me to "narrow my focus" ...I see now that diversity is my strength. All forms of creative expression are connected." Subjects: Landscape; Maritime; Figurative; Still life. Navigation: Website is designed by the artist. It remains easy to navigate and links remain available at all times. Image view is creative. Image View: Thumbnails enlarge on mouseover. Title, medium and size are listed. Downloading an image is possible if the cursor remains within the enlargement such that right click is available. Summer Solstice I is 30 x 24 ins, 500 x 375. 54 KB. Bio: Lyn Asselta's career in art has had her work as an elementary school art teacher, a draftsman, a calligrapher, a workshop instructor, and a creator of award-winning fine-art gourd vessels. She finally turned to pastels to express her feelings for the landscape, where most of her memories were distilled. Lyn had experienced the salt marshes and waterways of Florida, the Smoky Mountains of the Carolinas, and the rock-bound coast of Maine. 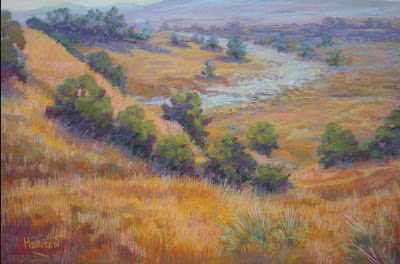 Pastel, as a medium, seemed to be the perfect metaphor for her relationship to the landscape. 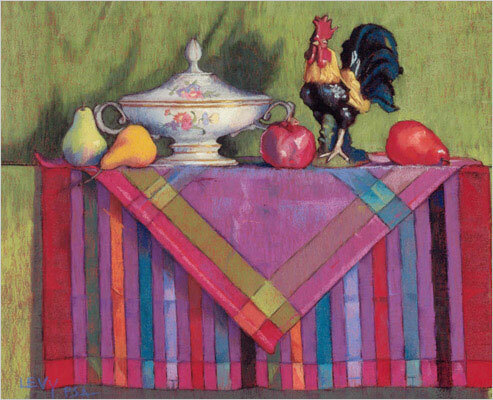 Lyn is a Signature Member of the Pastel Society of America and the Pastel Painters of Maine. 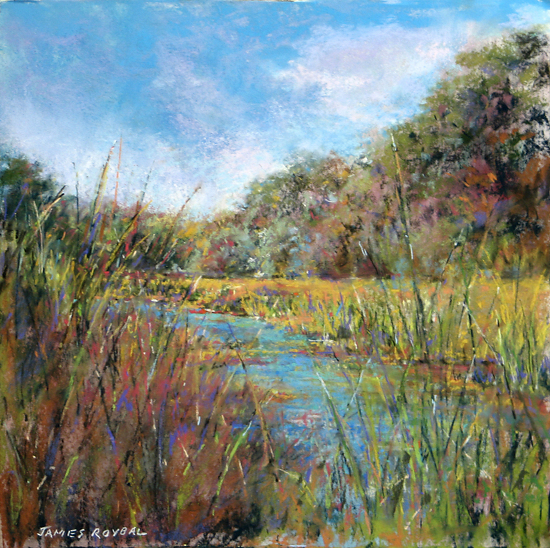 She is also a member of Landscape Artists International, the Southeastern Pastel Society, the North Florida Pastel Society, Plein Air Florida, the American Impressionist Society, the St. Augustine Art Association and the Jacksonville (FL) Coalition for the Arts. She is the founder and President of the First Coast Pastel Society. In 2009, Lyn was an Artist in Residence for the National Park Service at Acadia National Park in Maine. Lyn now lives and works in St. Augustine, Florida. Her paintings may be seen at the W. B. Tatter Gallery in St. Augustine, the Melrose Bay Art Gallery in Melrose, Florida, and the Haley Farm Gallery in Kittery, Maine. Medium: Pastel, often with a watercolour underpainting. Subjects: Landscape. Lyn likes to paint plein air whenever possible. Gallery: RECENT WORKS; Small Works Collection; Paintings from New England. (the two latter galleries are subsets of Recent Works). Image View: Thumbnails enlarge in a viewer, where they may be viewed in sequence, and where further information on their genesis is often provided (resting the cursor on the thumbnail provides information on the painting.) They may be zoomed further from the viewer. Download is not blocked. Receding Tide is 11 x 17 ins. 550 x 373, 168 KB. Bio: Born in Marseille in 1951, and living in Dijon, Claude Micheli studied in the Ecole des Beaux-Arts, and continued his studies as an autodidact and through contacts with other artists, in Marseille and Paris. He has had solo exhibitions since 1976 and began winning awards shortly afterwards. The influence of the classical masters is evident in most of his works, including the Italians of the 16th century. Indeed, one detects in his oil paintings and in his pastels the contrasts of light and shadow reminiscent of Caravaggio, or the sfumato of Leonardo da Vinci. The strength of his modeling, in his drawings and his early works is heavily influenced by Michelangelo. Romantics like Caspar David Friedrich or Russian Aivazowski have also left their mark. Among the more contemporary artists who have influenced Micheli one can cite Jackson Pollock, of whom he regards the stains thrown randomly on the canvas as life elements, and Francis Bacon, whose faces transformed in the process of dissolution evoke the work of Micheli. Subjects: Landscape; seascapes; abstracts. Despite a great diversity in variety of techniques, materials and styles used over time, the work of Claude Micheli is animated by some inspired elements, which appear regularly in his work. These are some forms (the square), certain materials, plant material such as wood, used as is or reproduced in surreal accuracy. Style: The skill of this artist is probably best discerned in his pastel seascapes; his abstracts are equally accomplished. Although abstract, they seem representational, a sort of minute organic analysis – I’m just amazed that he hasn’t put any computer-generated fractal images on the website, since he seems to have tried just about everything else. Navigation: The website is in French; once you go into Galeries, and choose one to view, a dropdown list becomes available to navigate the others. Bio: Michel Tiffet was born in Lamotte-Beuvron, France in 1931. At a very early age a natural ability to draw manifested itself. At 17 he entered l'Ecole Professionelle de Vierzon where he pursued his studies and obtained a diploma as Peintre-Decorateur Ceramiste. Upon graduation he was commissioned to create exclusive porcelain decorations by the House of Limoges. A silver medal recipient at l'Exposition de Vierzon, he was also member of numerous artists associations, in particular that of Artistes Orleanais de l'Ecole des Beaux-Arts. Painting never ceased to fascinate him so he joined the studios of J.G. Domergue in Curly. In 1951 he was called up and spent two years in Tunisia where his time is shared between his military training and his artistic pursuits. He owes his early inspiration in part to the landscape of the Sologne (setting of the French classic Le Grand Meaulnes) for its autumn scenery, woods and ponds. These landscapes are apparent in his first drawings and gouache paintings dating from the 1940's. In 1966 Tiffet moved to Quebec, where he pursued the profession of pastel artist, along with his assiduous activities as art teacher. He is a signature member of the Pastel Society of Eastern Canada and is currently professor at Plateau Mont-Royal, Québec. Style: His naturalistic landscapes are characterized by a strong sense of light and shadow as well as a lavish chromaticism. Navigation: A bit tricky this, and the website is in French. There seems to be a number of ways to access the galleries or “collections”. To see the pastels; click on Sculptures et Pastels, and note that there are two pastel galleries. Image View: Thumbnails enlarge in new page; there is no detail on dimension of original work; download is permitted. Impressions de campagne is 642 x 509, 69 KB. 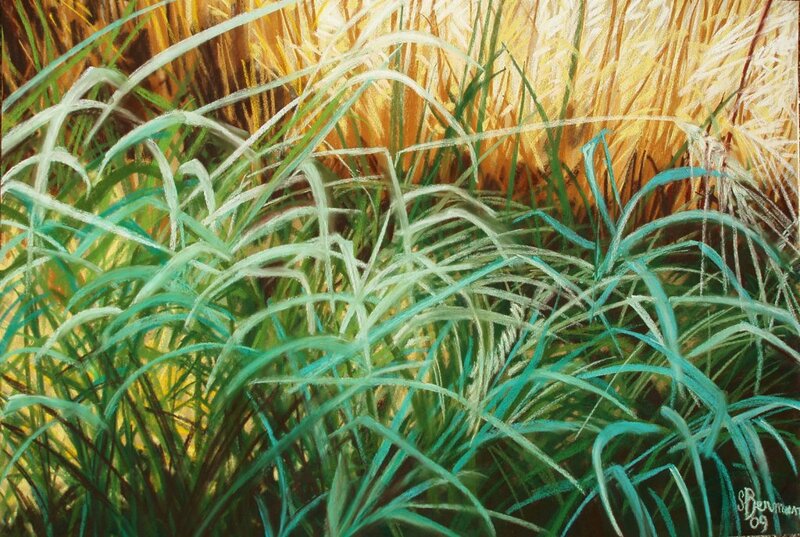 Bio: Quebec artist Marcelle Simard is a signature member of the Pastel Society of Eastern Canada, and lives at Mont-Saint-Hilaire in Montérégie. A committed artist for many years, she has achieved a high standard through attending workshops in Canada, the United States and Europe, with artists such as Ben Konis, Bob Rohm, Charles Gruppe and Sam Gibbons. She has been happy to transmit that knowledge to her own students over the years. She has been showing her work in group and solo exhibitions since at least 1997 and participates every year in many painting salons throughout Quebec. Navigation: Links remain available at all times at top of page. Image View: Large thumbnails only. There is no information provided on medium of dimension of painting, although I assume that all her pastels are grouped under that heading in the gallery pages. Bio: William Wilson was born in Tours, France en 1952, his mother was from Orléans and his father of Togo-Benin origin. He grew up in Orléans. At 18 years of age, he went to Paris to study philosophy and ethnology. When he discovered the world of art and artists he decided to become a painter. After numerous trips to Europe and West Africa, (1970-1980) interspersed with various jobs in journalism and music, he held his first exhibition in Paris in 1976. But it’s from 1983 that he regularly exhibited his work, in France, Europe and Africa, followed by the USA. In 1986, he received the Prix de la Villa Médicis Hors-les-Murs and spent more than a year in the US. At times Wilson works in collaboration with other artists. He has worked with Dominique Bagouet on the décor and costumes for a dance piece Les petites pièces de Berlin. He has also designed scarves for Louis Vuitton, and worked for Rodier, and for Arches shoes. He has been an illustrator for publishers such as Gallimard, Folio, Flammarion, and for magazines, such as New Yorker, Zurich's Du, Télérama and Libération. He has also designed posters for cultural events. In 1994, he spent three months travelling with writer Isabelle Jarry in the American South-West. 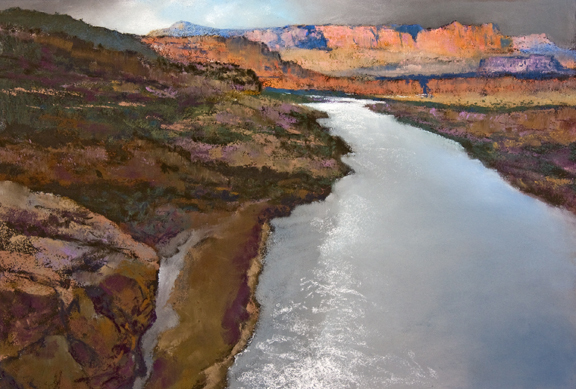 On his return he produced a series of 11 huge pastels (150 X150 cm) Le voyage en Arizona. Medium: Pastel; sculpture; wooden constructions; prints; collage. Isabelle Jarry has this to say of him: Chance, more often than we think, presides over the destinies of men. And the reasons why an artist chooses one medium over another remains unclear, imprecise, as if lost in the distant past. Unless the time has not erased the memory, blurred as by a finger a patch of colour that you want to soften ... It seems, to hear William Wilson, that the decision to use pastels was independent, without forethought, without any justification other than the pleasure of finding the coloured chalks of childhood and the desire to explore the wealth of material that is spread with the fingertips, without an intermediate tool. He liked the matt appearance, too, the powdery aspect, a tribute to the powders of ochre and earth used by African artists on their masks and sculptures, and also for ritual paintings made ​​directly on the skin. But if chance slips everywhere, it is not therefore blind and deaf, and can we not, once again, let chance be the emcee when we learn that William Wilson’s first exhibition opening took place in a studio lent by a friend, lover of parrots? During the three days of the exhibition, four pairs of parrots, left free by their owners, traced in the sky of the huge glass-ceilinged atelier streaks of red, green, yellow and white, animating the colors of the pastels hanging on walls, hammering the ears of visitors with their screams. Movement, colour and freedom, the tone was set. Style: Matches his subject matter. Image View: Thumbnails run along bottom of viewer and enlarge therein. Information is provided if you click on Infos in top left corner of viewer. Du monde dans le moteur is from the Arizona series. It is 150 x 140 ins cm. 640 x 480, 56 KB. Bio: Wade Zahares is an artist and illustrator who works chiefly in pastels. Both a fine artist and a children’s book illustrator, Zahares has always loved to draw. Since graduating from the Maryland Institute, College of Art, he has been a full-time, professional artist. His work has been commissioned by Boston Duck Tours, Bank of America, McDonald’s, HBO, Cinemax, and Family Circle and Sesame Street magazines, and is in the permanent collection of the DeCordova Museum in Lincoln, Massachusetts. Both Time Magazine and The New York Times cited his first children’s book, Window Music, as among the best picture books of 1998. Since then, Wade also has illustrated Pony Island; Lucky Jake; Liberty Rising; Big, Bad, and A Little Bit Scary: Poems that Bite Back! ; Red Are the Apples; and Delivery. He lives in Lyman, Maine, and teaches at Heartwood College of Art, Kennebunk. He is much in demand as a visiting lecturer in schools, colleges and art institutions. Subjects: His pastel paintings are magical scenes that pull readers in with their sweeping curves and unexpected angles. They can be very large for pastels; up to 3.5 x 6 feet! Navigation: Website is totally visual – all important links are by way of an image map. Image View: Images enlarge in a viewer, where the enlargements may be viewed serially; they may not be saved. Dimension is recorded. The Snow Line is 18 x 31 ins. Bio: Gregory Wellman (b. 1971) is a professional portrait painter currently based in Devon, U.K. and is a member of Artists for Conservation. In 2011 Gregory was the first Artist in Residence at the Cultural Heritage Centre, Arusha, Tanzania. He has been short listed for the Daily Mail’s Not The Turner Prize, commissioned by The Royal Marines' Rifle Association and has had work exhibited at The Mall Galleries in London. Clients and collectors, including film directors and actors, can be found in London, Chicago, Beverly Hills, Europe and Australia. (Kenneth Branagh commissioned him to paint portraits of the cast and crew of As You Like It). An in depth review of Gregory’s work appeared in the June/July 2012 issue of International Artist (No. 85). Navigation: Links available at all times on top of page. Gallery: For the pastels, click the Maasai link.